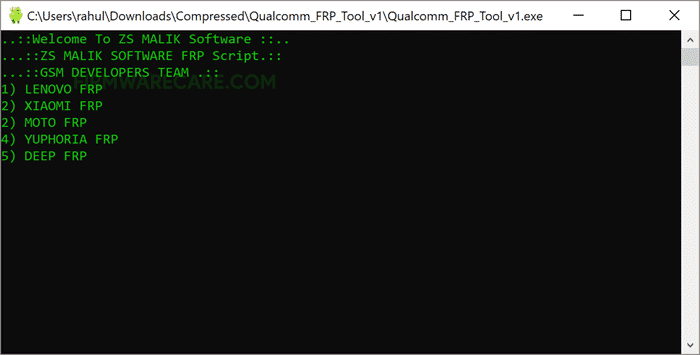 Qualcomm FRP Tool is a small application for windows computer created by ZS Malik, which allows you to remove the Android FRP Protection from the Android Devices running on Qualcomm Chipsets. It allows you to remove the Android FRP protection from Lenovo Devices, Xiaomi Devices, Motorola Devices, Yu Yuphoria Devices, Deep Devices. In order to use the Qualcomm FRP Tool, you have to install the ADB Driver on your computer. Once driver is installed, connect your Android Device to the Computer and Launch the Tool. Once tool is launched, Select the available options as per your Brand Name and Hit Enter Key. [*] Compatibility: The Qualcomm FRP Tool runs perfectly on Windows XP, Windows Vista, Windows 7, Windows 8, Windows 8.1 and Windows 10 (32 bit and 64 bit). [*] Credits: Qualcomm FRP Tool is created and distributed by ZS Malik (developer). So, full credits goes to ZS Malik (developer) for sharing the tool for free.